When purchasing High-involvement products such as expensive smartphone, car or house, there are plenty of expert reviews available for a buyer to make an informed decision. However, for limited involvement products like hand blender, hdmi cable, electric shaver etc., there might not be much expert help available leaving user to go through several customer reviews for each product brand. Based on a research article “Ecommerce consumer reviews: why you need them and how to use them” (Graham Charlton, EConsultancy), 61% of customers read online review before making decision. Customer reviews are significantly more trusted (almost 12 times more) than descriptions provided by manufacturer. 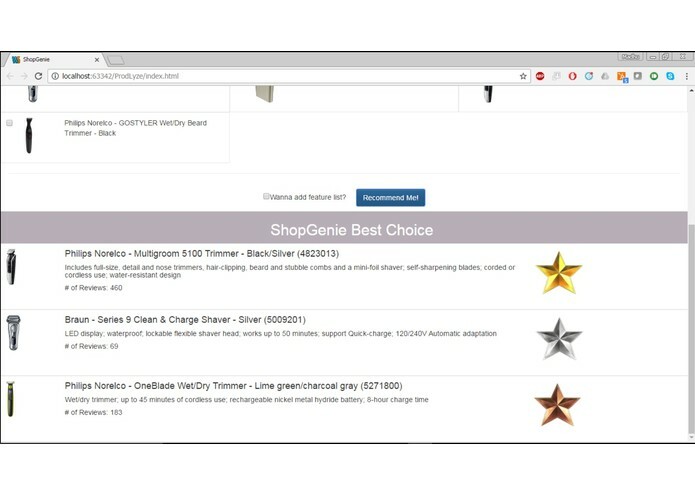 Our Web Application ShopGenie aims to help new users by presenting them with most talked about feature by other existing users and help them narrow down their search to the features that matter most to them rather than just relying on a 5 star point rating system. The recommendations are simplified and intuitive yet based on sound underlying analysis. ShopGenie is a one-stop shop that provides the best buying recommendation according to criteria’s that actually matter to the consumer. As with our hand blender example, the new user will be able to input the feature that is most important to him/her such as value for money, ease of use, high speed etc. and our app will be able to recommend the top products as per the criteria. 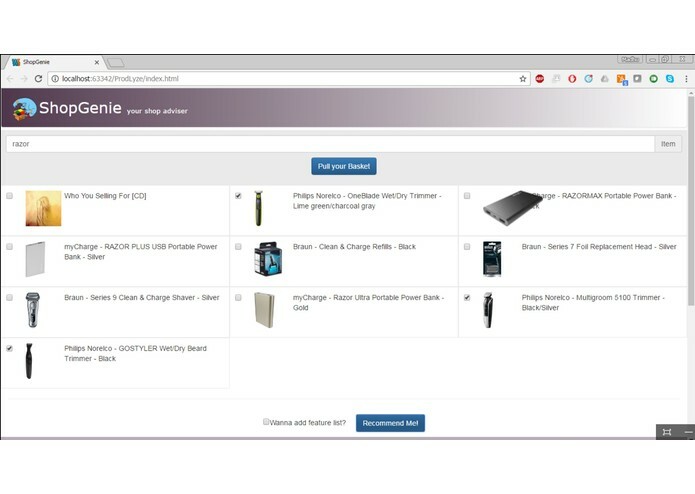 Once the new user inputs the product of interest, ShopGenie lists all brands for the product from eCommerce website like BestBuy, Amazon, and other eCommerce website. The user can select any number of brand (minimum 3) and the App will rank the products based on sentiment score (rather than rating system). The user can then specify the feature that is of most interest to them. The App would then recommend top 3 brands most relevant to the feature. Able to build an business value project in short span of time with complex analysis process and integration of different technologies. We learned the practical issues in natural language text processing, making the best judgement out of the available resources such as tools, technologies and man power. In addition to it time management and team work an additional learning. ShopGenie does have lot scope for value addition in terms of integrating with e commerce sellers, customer interactive visualizations for informed decision making for a wide variety of goods. It has the ability of integrating with wide range of e-commerce sites and business news papers and able to deliver a specific quick recommendation for customer out of available customer inputs. It can further go well on various machine learning processes to get deep insights for decision making for various businesses. It can have scope for building a mobile app technology becoming a must use assistant for shopping. We can include many business value additions such as running online coupons and other promos for enhancing additional revenue. It can bring predictive analytics based on the customer purchases pattern which is a great value addition in future. I worked on building the code for sentiment analysis in python. In addition devised business logic for measurable insights to provide customized recommendation. Also contributed in creation of idea and leading it to a workable solution. I worked on backend using the python to pull the products and their reviews from BestBuy. Developed the user interface to show results of the products and show recommendation derived from ShopGenie algorithm. Worked with python in making the backend logics. I learned how to make use of API and writing the generalized functions.